Jayadeva, considered by many as the precursor to the bhakti movement in India, wrote his composition in eight sections or ashtapadis. He was the first poet to emphasize that listening to the leelas of Krishna can lead one on the path of moksha. This concept was explored by the astachaap poets like Surdas in the Vallabhacharya sect. As per noetic science expert Lynne McTaggart, 8 is the number of people needed in a group, that working together is able to send out a sustainable thought through the universe. In mathematics it is the first cubed number(23=8). This pattern of tihai, trimurthi or tridevi is again prevalent in Indian culture. In Hinduism, eight is the number for abundance as reflected in the ashtalaxmi. The ashtadisha (eight directions) and their guardians as well as the ashtavinayakas are other occurrences of a power split among eight deities. In Mahayana Buddhism, we see the eightfold path of gyana. Again, Patanjali describes the eightfold astanga marg of yoga. 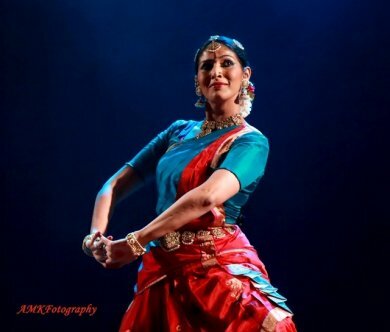 Thus the 'ashta' is synonymous with journey of the seeker, one that Bharatanatyam exponent Prachi Saathi took the audience on through her solo Bharatanatyam piece 'Ashtaleela' performed at Gauranga Auditorium, Iskcon, Mumbai on 25th March 2019. Prachi is a disciple of Rama Vaidyanathan, Vaibhav Arekar and Lata Raman. Set on the banks of the Yamuna, ashtaleela is a journey of the ashtanayikas of Surdas, depicted in this production as eight gopikas. Prachi begins by establishing these eight different sakhis on the stage through signature poses. The first nayika Vasaksajja is established through an English narration - The chakor craves the moon, and I you; where are you Oh Kanha - as Prachi sets the mood for sambhog shringara followed by the Surdas composition 'Jagmag rahyo jarai ko teeko, ratna jadita ke subhag taryona' (her fair body adorned with glittering garments, enhanced by the brilliant jewel on her forehead). The shringara of the nayika ends with her waiting for Krishna with unblinking eyes similar to that of the mystical chakor awaiting the moon (drig bhari rahe chakore ho). Just as one is drawn into the world created by Prachi, the music abruptly ends leaving the audience dissatisfied, setting the mood for the Virahotkanthita nayika - bin gopal bairan bhayi kunja (without Gopal, this garden is my enemy). The nayika gives up, herself extinguishing the lamp in her hand. Prachi uses the popular iconography of the nayika waiting with a lamp in hand, which is a subject of many miniature paintings and easily recognizable by even a lay audience. The next nayika is the Svadhinabhartruka who is teased by all the other women of Brij that she is the one who has managed to capture the elusive Krishna (Puni puni kahati hai brij naari, tere bas hai giridhaari). Though the womenfolk claim that only her name is heard in the melody of his flute, even this nayika has no luck in meeting Shyam in Prachi's depiction. The nayika says 'Am a rose without its scent, and burn in the relentless fire of regret,' as Prachi portrayed the different shades of the Kalahantarita nayika. Though she begins by being angry at Krishna, she realizes that it is her own shortcomings, resulting in an oscillation in emotions portrayed by Prachi, which makes her embark an inner spiritual journey through Surdas's words 'Mai apne jiya garva kiyo, woh antarjaami sab jaan liyo, ahankaar phal yahi diso' (the omnipresent one has recognized my false arrogance, and I have received its fruits). Just as the nayika accepts this situation, she realizes that Krishna has been with another nayika (raat dwaar kapaat diyo ri). Interspersed with vigorous nritta, the anger of the deceived Khandita nayika was a direct contrast to the spiritual turn that the previous Kalahantarita took in Prachi's portrayal. The next Vipralabdha nayika compares Krishna to a bee who just comes to the flower to fulfill his pleasure (ras ke kami). She asks the question, 'How is it possible to understand the ways of Krishna?' In parallel, the Proshitapatika awaits his return. The popular Surdas bhajan, 'Akhiyaan hari darasan ki pyaasi' was interestingly presented as a kautuvam by Prachi, lending an unexpected twist to the familiar lyrics. In a final heart rending cry of 'Krishna!' she falls to the floor in a pile of her own scattered hair. The final nayika is the Abhisarika who rushes towards Krishna listening to his flute (chali ban benu sunat jab dhaai). However, like the seven nayikas before her, even this one does not meet Krishna. As she turns around to see who is it that pulled her veil, expecting it to be Krishna, it turns out to be a tree in which the end of her veil was stuck. Throughout the journey of these eight nayikas, Prachi leaves the view with unsatisfactory and sometimes abrupt endings, giving one the feeling of being a part of an unfinished story. But now she introduces Krishna through the famous 14th century Sanskrit composition of Bilvamangala Thakur, Kasturi tilakam. The previous eight stories reach completion amidst silence as Krishna goes to each of these nayikas and completes the story, wearing the garland offered by the vasaksajja, lighting the lamp of the virahotkanthita, applying sandal paste from his own body onto the svadhinabhartruka, placating the angry nayikas, himself braiding the hair of the proshitapatika and lastly freeing the veil that was stuck in the branch and adorning the abhisarika with it. Interestingly, Prachi had spatially positioned these nayikas in such a way so that as Krishna moves from one to the other the western figure eight, also a symbol for infinity, emerges. We now reach the climax of the piece where Krishna engages in the raas leela (Gopi gopala bala, rasamandala maahi). Interestingly, Radha was never mentioned, but now the gopis dancing together become one in the raas mandala to manifest the divinity of Radha in Prachi as well as in the rasika, giving a spiritual climax to the 50-minute solo by Prachi. The music composition, rhythmic arrangements and nattuvangam was by Dr. S. Vasudevan, vocals by K. Venkateshwaran, mridangam and ganjira by Sumod Sreedharan, violin by Viju Sivanand, pakhawaj by Ganapathi, sitar by L. Kishore Kumar, flute by Rajat Prasanna, morsing by Sundar. Light design was by Deepa Dharmadhikari, and costume design by Sandhya Raman. The concept was inspired by a research article written by Ojaswita Chaturvedi. 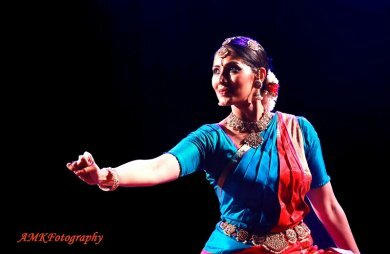 Based in Mumbai, Sunil Sunkara is a Kathak dancer with a PhD degree.